I am looking for a 10 inch long Carter’s Just One Year blue dog that I gave to my son for his first Christmas. 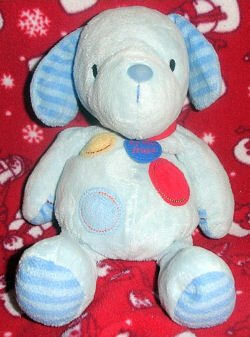 “Puppy” is light blue with one blue, yellow and red spot on his tummy. He also has a red collar around his neck with a blue tag that says my best friend. He also has stripes on the bottom of his feet and on the inside of his ears and rattles when you shake him. My son is 20 months old and took “puppy” everywhere with him. He left it at the sitter’s house last night, and without her knowing her dog got hold of “puppy” and nothing is left of him. I am in desperate need of finding another one. The price is high, but I found this one on ebay… 120399732514 I’ll try looking again later. Good luck in the meantime. Thanks!! I emailed the Mailing List on this one. Here is the puppy on Ebay item number 150338148997.